The Card Chronicles: Washi Celebration! Happy Humpday! This time of year is very busy for Student affairs. When you couple that with additional activities, you week just gets jammed pack! This upcoming weekend, I am doing my very first card party for a friend! I thought I would give you a peek at one of the cards I am considering as I put the card materials together (I apologize for the not great picture). This idea I loved for how simple it was to make the card look great. I found it on Pinterest, which linked it back to Nutmeg Creations who has some great ideas! For this card base I used Smoky Slate cardstock. 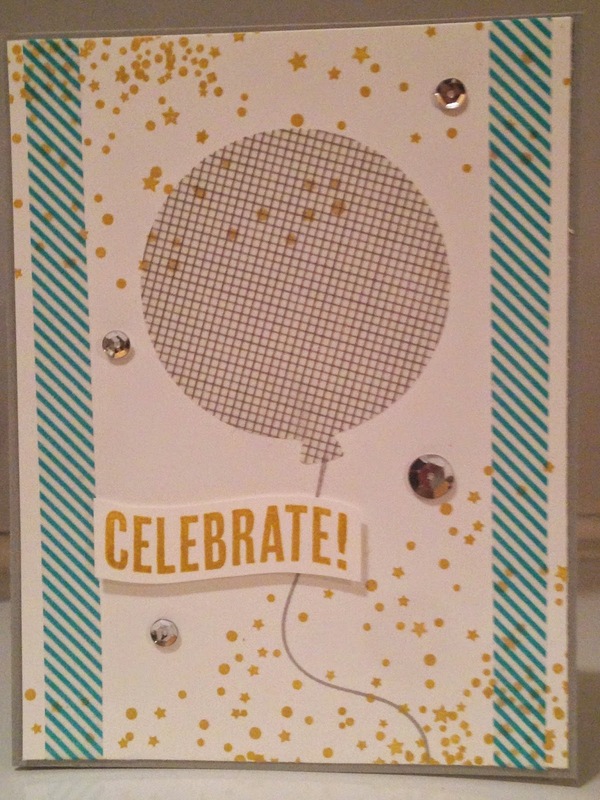 On the white cardstock, I stamped the confetti images and "celebrate" from Celebrate Today in Hello Honey. The rest was all done using the Birthday Bash washi sheets dye cut for the balloon and cut into strips for the sides. I added the balloon tail by manipulating the tail in the Celebrate Today set. As tricky as it can be to sometimes get the photopolymer stamps on straight, this was so convenient that it allowed me to make it curvy. I finished the card by adding just a few sequins to glam it up.